Accompanying a feature by Mavis & Geoffrey Nicholson looking at "some of the heroes young viewers will see this Christmas (1966)"
Many people, witch-hunting for transatlantic influences, assume that 'Thunderbirds' is American. In fact, it is made at Slough by AP Films, formed nine years ago by Gerry and Sylvia Anderson and now an ATV subsidiary. Anderson believes that British children accept American accents and settings since they associate rockets with America - and it helps sales in the US television market. These are likely to bring in £7-10 million. 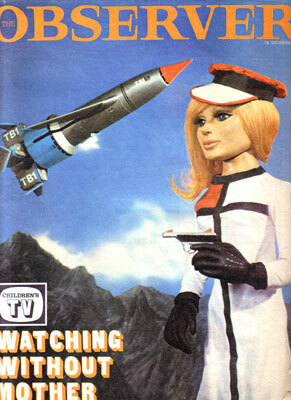 The projected retail figure for the exploitation of Thunderbird toys, sweets, books and comics in 1966 is £6 million. The Andersons write all the initial scripts; Sylvia is also the voice of Lady Penelope Creighton-Ward, International Rescue's London Agent and one of television's sexiest creatures. This is their seventh series, reached via 'Twizzle', 'Torchy', 'Four Feather Falls', 'Supercar', 'Fireball XL5' and 'Stingray' - a remarkable discard rate. "I'd love to see them continue," says Anderson, "but a new approach, a new article, is more readily saleable." Each series marks a technical advance. The puppets' heads are packed with electronic devices to make their lips respond to the sound-track. A 15-man crew spends 20 working days on a one-hour episode, re-shooting and puffing the strings out of sight by aerosol spray. The Andersons set them fresh problems each time: "If we can already do it, it's old fashioned."